My mom really likes taro so I tried making taro cake from scratch. It is very easy to make. When you are washing, peeling and grating the taro, wear a pair of gloves. In a large bowl, mix the rice flour and salt with cold water until the flour and salt dissolve. Heat the oil in a large frying pan and fry the onion until lightly brown and fragrant. Add the dried shrimp and chinese sausage and stir fry until the sausage is browning. Add the grated taro and immediately remove from the pan from the heat. Mix the taro with the chinese sausage mixture. Add the taro mixture into the rice flour batter and mix. Add the boiling water into the mixture and stir quickly to combine. The batter should not be thick. Divide the batter into two lightly greased pans. Prepare the steamer and bring water to a boil. (Here are detailed instructions for how to steam cook food.) Steam the taro cake for 20-30 minutes (depending on which pan you’re using) or until a tooth pick inserted into the center of the cake comes out clean. Do not overcook. Remove from the steamer and cool completely before cutting. 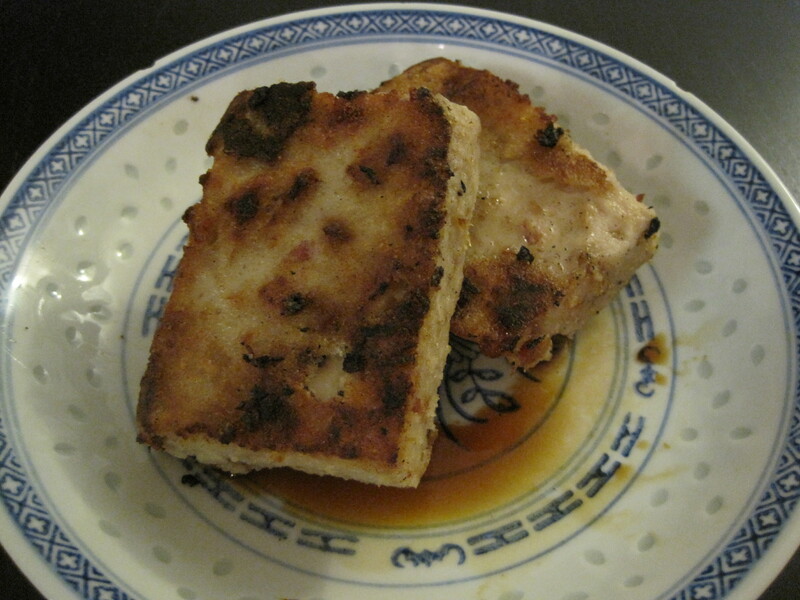 In a lightly oiled frying pan, pan fry the taro cake slices until golden brown on both sides. Serve warm with sweet soy sauce.